If you’ve ever watched a movie trailer, product review, or adorable cat video or your computer, then you’re probably familiar with YouTube. With over 300 hours of content uploaded every minute, it has quickly become the Library of Alexandria for the digital age. These days, people use YouTube as a one stop shop for sports highlights, academic help, current event recaps, DIY tutorials, and original TV shows or movies. However, even when you consider how massive YouTube’s content stockpile is, some topics and areas of study are noticeably underrepresented. If you’re a welder, engineer, fabricator, or student interested in welding research, metallurgy, and technology, you’re pretty much out of luck, right? These presentations, over four dozen in total, were originally delivered during educational sessions at FABTECH, or as part of other industry conferences. They take the form of video podcasts that include the presenters in addition to juxtaposed graphs, charts, and other supplementary visuals. This makes it a bit easier to follow along and digest the information being discussed as these presentations are usually very technical in nature. The welding industry has grown in remarkable ways as a result of breakthroughs achieved by members of the welding community all over the world. This has been the case since its infancy in the early 19th century. The discovery of acetylene? Thank you, Sir Edmund Davy of England. Carbon arc welding? Brought to you by Stanislaus Olszewski and Nikolai Benardos, a pair of Russian scientists who built on the work of Auguste De Meritens, a French researcher. Arc welding with metal electrodes? That was Mr. C.L Coffin of Detroit, Michigan. Today, the push for new technology and innovation continues to be a global effort, as evidenced by the wide range of research labs, organizations, and universities the presenters in our videos hail from. This includes the Beijing University of Technology in China, Voestalpine Böhler Welding in Austria, the University of Alberta in Canada, the National Nanotechnology Lab in Brazil, and the Brandenburg University of Applied Sciences in Germany. And of course, there are a slew of presentations from some heavy-hitters here at home, including the Ohio State University, the Los Alamos National Laboratory in New Mexico, the Colorado School of Mines, and several material science research outfits in Cambridge, Massachusetts, possibly the brainiest city in the world. By the time you read this, we’ll already have a handful of presentations ready for you to binge watch. More importantly, we’ll be adding more in the coming days, weeks, and months, including some from this past year’s FABTECH in Chicago. As our video podcast library continues to grow, you’ll want to make a point of check in every once in a while so that you don’t miss out. 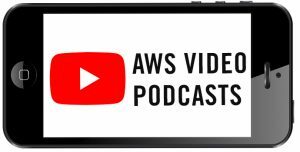 The best way to ensure you catch all our new releases is to subscribe to the AWS YouTube channel. Better yet, make sure you enable the notifications feature. This way, you’ll get a heads up as soon as new content arrives! As excited as we are to offer such a robust collection of technical presentations to the welding community at large, it doesn’t end there. If you, your colleagues, or your students are interested in broadening your knowledge base, or could use a friendly starting point before tackling heavier material, it may behoove you to check out AWS Learning’s collection of online courses and other offerings. In any industry, but especially in one as fast-paced and technology-driven as welding, staying in tune with the latest research and developments is a big part of success. Knowledge is power, and in an era saturated by misinformation and click bait, making an active effort to learn as much as you can is more important than ever before.